Gurumin: A Monstrous Adventure, known simply as Gurumin (ぐるみん, Gurumin?) in Japan, is an action-adventure video game developed by Nihon Falcom Corporation. Originally released on December 25, 2004 for PC. A PSP version was later released in Japan on June 29, 2006 and North America on February 13, 2007. The actual origin of the title "Gurumin" has never been officially explained, but it's likely a combination of the Japanese word "guruguru" (basically an onomatopoeia for spinning) and the kanji 民 (min), which means "people". 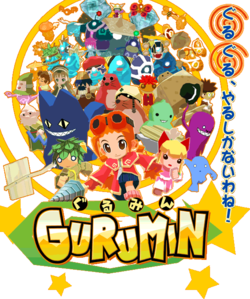 So ぐる民 "gurumin" could potentially be interpreted as "people of spinning/twirling," or to expound a bit, "twirlanders." A young girl named Parin goes to live with her grandfather in Tiese Town after her parents are called overseas on an excavation trip. After being told that there are no other children in Tiese, she finds what looks like another girl who is being threatened by a dog. Parin rescues the girl and discovers that she is actually a monster (お化け (obake, お化け?)) which only children can see. To thank Parin, the monster takes her to a crack in the back wall of the town which is revealed to be a portal to the monster world. A group of monsters known as phantoms begin a series of attacks on Monster Village. Parin, who unearths a legendary drill, decides to fight against the phantoms and restore Monster Village. North American and PAL region PSP cover art.